Congress vice president Rahul Gandhi Thursday said the Congress practices the "politics of harmony" and, taking a jibe at BJP's prime ministerial aspirant Narendra Modi, said some people only spread hatred. 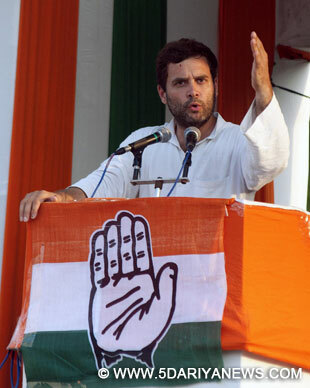 "Hindustan har kisi ka hai... Hindustan mein rahne wale har Hindustani ka hain... (India belongs to all... it belongs to everyone living in India)," Rahul Gandhi said at an election rally in Bihar's Gopalganj parliamentary constituency.He accused Modi of being opposed to this concept and said some people only spread hatred by opposing it. "Our party practices politics of harmony... Others only believe in talking about hatred (Hum pyar ki rajniti kartein hain jabki doosre log nafrat ki baat karte hain)," he said.He said the Bharatiya Janata Party leaders' accusations that the maximum number of terrorist attacks took place during the 10 years rule of the Congress-led UPA government were far from truth. "During the five years' rule of BJP-led NDA government, 22,000 people were killed in terrorist attacks, while only 800 people were killed in terrorist attacks during the UPA rule," he said.He spoke of the Right to Information act, the National Rural Employment Guarantee Act, and the Food Security act, which were all brought during the UPA government.He said Modi has been lying that nothing has happened in the country in the last 60 years. "Ask people above 50 years of age whether the country has changed or not," he said.